Lord Swraj Paul, the great business magnate was born in 1931 in Jalandhar, Punjab. Having learned business lessons from his father at a young age, he later founded the successful multinational company Caparo, an UK-based steel and engineering group. Swraj was educated at Punjab University and obtained a master's degree in mechanical engineering from the Massachusetts Institute of Technology (MIT) in the US. In 1953 he returned to India to join the Apeejay Surrendra Group, founded by his father, which he helped build up to a diversified industrial group. Swraj went to England in 1966 hoping to find a cure for his leukemia-stricken two-year-old daughter, Ambika. Shattered by her death, he buried himself in work and there began his spectacular business career in Britain. In 1968, he started buying and selling steel in a one-man business and acquired a small tube unit, Natural Gas Tubes (NGT), which developed into one of the leading UK producers of welded steel tube and spiral welded pipe. Gradually he bought more units, mainly in the steel products manufacturing industry and founded Caparo Group in 1978. Her Majesty the Queen knighted Swraj Paul in the same year, thereby making him The Lord Paul of Marylebone and a member of the House of Lords. Lord Paul has been honoured by various international organisations over the years. He has written the biography of Indira Gandhi and was awarded the Padma Bhushan by her in 1983. Among the honours bestowed on him are the Pro-Chancellorship of the Thames University (1998) and its Governorship (1992-97), Chancellorship of Wolverhampton University and the Bharat Gaurav award by the Indian Merchant's Chamber. He is a member of the Foreign and Commonwealth Office's Foreign Policy Centre Advisory Council and MIT's Mechanical Engineering Visiting Committee. 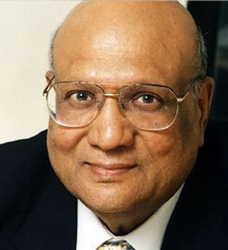 Swraj stepped down from the management of Caparo in 1996, handing over his empire to his three sons. Though he is one of the richest persons in the U.K., in his personal life Lord Paul practices relative simplicity. But he believes in making money so that he can occasionally use it to help the needy or even bail out the London Zoo.